In this work, an end-to-end non-iteration-based deep residual convolutional neural network compressive sensing reconstruction (DRCNN-CSR) framework is proposed. Proposed recovery model takes advantage of residual learning to make our model deeper and be optimized within reasonable time. 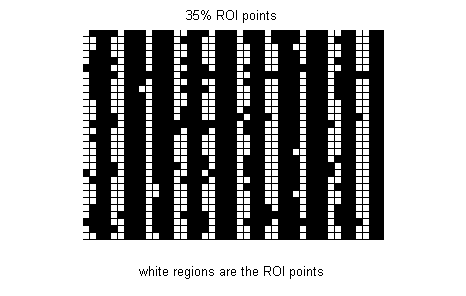 Furthermore, the non-iterative feature of the proposed model greatly reduces the computation time, and an end-to-end reconstruction of the whole image. Moreover, we also propose an adaptive undersampling rate strategy to adjust the under-sampling rate in different local areas to address the uneven sample information density problem. 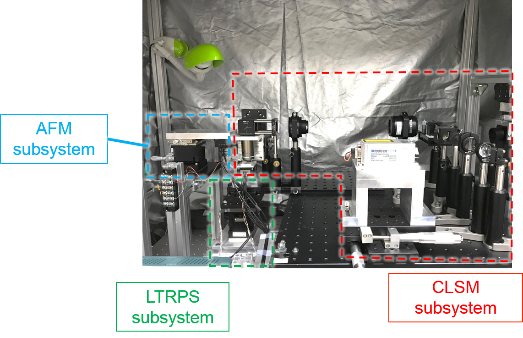 Finally, the experimental results show that our proposed framework is robust and feasible for fast CLSM imaging application. Hybrid scanning microscope by integrating Atomic-Force Microscope (AFM) and Confocal Laser Scanning Microscope (CLSM) is widely used in measurement. We develop a cooperative scanning strategy to achieve high-speed and high-precision image, simultaneously. First, we obtain a coarse 3D image by CLSM. After that, we based on calculating spatial entropy of CLSM image to obtain regions of interest (ROI) in AFM for finely scanning. 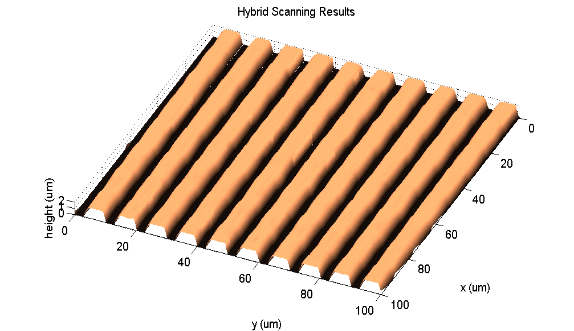 Finally, we integrate the scanning results from CLSM and AFM to obtain a hybrid image. The experimental results show it saves total scanning time, while keeping the resolution which is slightly inferior to traditional AFM. A novel dual probe AFM developed and combined with an effective tilting angle scan strategy that achieves higher scan accuracy than those with the conventional AFM. 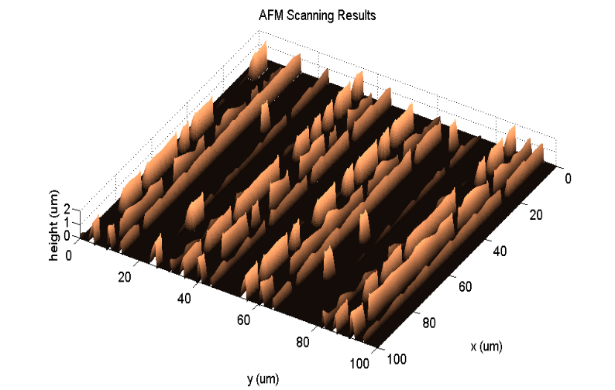 A novel integrated microscopy combined AFM with CLSM is developed to resolve the short scanning range of AFM and extend the application. Combined with compression sensing, the scanning speed of LSCM can increase significantly by reducing the sample data so that the scanning time of integrated microscopy will also decrease. Yu-Ting Lo, Jim-Wei Wu, Wei-Chih Liu, Da-Wei Liu, Kuang-Yao Chang, and Li-Chen Fu “Adaptive Tilting Angles for a Dual-Probe AFM System to Increase Image Accuracy,” Proc. of 55st IEEE International Conference on Advanced Intelligent Mechatronics, Canada, July 12–15, 2016. Yu-Ting Lo ( 羅宇廷 ), "自適傾角演算法於高精確雙探針原子力顯微鏡 ," Master Thesis, Department of Electrical Engineering, National Taiwan University, R.O.C., 2015. Yi-Ting Lin ( 林奕廷 ), "最適傾角之高精確掃描雙探針原子力顯微鏡系統 ," Master Thesis, Department of Electrical Engineering, National Taiwan University, R.O.C., 2014. Chih-Lieh Chen ( 陳志烈 ), "光學顯微鏡輔助之大範圍原子力顯微鏡精密正弦式局部掃描 ," Master Thesis, Department of Electrical Engineering, National Taiwan University, R.O.C., 2013. 陳駿智,"應用於細胞三維輪廓重建之相位偵測模式原子力顯微鏡設計與控制 ," Master Thesis, Institute of Electrical Engineering, National Taiwan University, R.O.C., 2012. Ming-Chiuan Shiu ( 黃冠嘉 ), "開發一複合式精密掃描平台應用於大範圍掃描量測之原子力顯微鏡 Development of a Precision Hybrid Scanner for Large Measurement-Range Atomic Force Microscopy," Master Thesis, Institute of Electrical Engineering, National Taiwan University, R.O.C., 2012. Yuan-Zhi Peng ( 彭元知 ), "設計與控制一精密電磁驅動平台應用於長行程原子力顯微鏡 Design and Control of a Precision Electromagnetic Positioner for Large Measurement-range Atomic Force Microscope,"," Master Thesis, Institude of Electrical Engineering, National Taiwan University, R.O.C., 2011. Kuan-Lin Huang ( 黃冠霖 ), "以撓摺機構設計並實現之新型三自由度精密電磁致動平台 ," Master Thesis, Department of Electrical Engineering, National Taiwan University, R.O.C., 2010. Shan-Tsung Lee ( 李繕琮 ), "電磁驅動平台於長行程高精度加工之控制與應用 ," Master Thesis, Department of Electrical Engineering, National Taiwan University, R.O.C., 2009. 嚴世勳,"新型原子力顯微鏡使用DVD讀取頭在水裡之應用 ," Master Thesis, Institute of Electrical Engineering, National Taiwan University, R.O.C., 2009. Chih-Hsien Lin ( 林志憲 ), "新型電磁致動與減震之三自由度撓摺結構精密定位平台/strong> ," Master Thesis, Department of Electrical Engineering, National Taiwan University, R.O.C., 2008. 胡琬琳,"以光學讀取頭系統實現之輕敲式液相原子力顯微鏡設計與控制," Master Thesis, Institute of Electrical Engineering, National Taiwan University, R.O.C., 2008. Sheng-Chih Huang ( 黃聖智 ), "以磁力與流體之混合機構實現新型六自由度精密定位平臺 A Novel Six-DOF Precision Positioner Utilizing Hybrid Mechanism with Magnetism and Fluid," Master Thesis, Institude of Electrical Engineering, National Taiwan University, R.O.C., 2007. 林孟滸,"以光學讀取頭系統實現之輕敲式原子力顯微鏡," Master Thesis, Institude of Electrical Engineering, National Taiwan University, R.O.C., 2006. Zhao-Kai Wu ( 吳兆開 ), "以撓褶式機構實現之新型六自由度電磁致動精密定位平臺 A Novel 6-DOF Electromagnetic Precision Positioner Utilizing Flexure Mechanism," Master Thesis, Institude of Electrical Engineering, National Taiwan University, R.O.C., 2006. Hsuan-Han Huang ( 黃宣翰 ), "以撓褶式機構設計並實現之新型三自由度電磁致動奈米定位平臺 Design and Implementation of a New 3-DOF Electromagnetic-Nanopositioner Utilizing Flexure Mechanism," Master Thesis, Institude of Electrical Engineering, National Taiwan University, R.O.C., 2005. Chia-Feng Tsai ( 蔡嘉峰 ), "整合設計與控制以提升系統強度及定位精度於平面式磁浮系統Integrated Design and Control to Improve Robustness and Upgrade Positioning Precision on a Planar Maglev System," Master Thesis, Institude of Electrical Engineering, National Taiwan University, R.O.C., 2004. Tzuo-Bo Lin ( 林佐伯 ), "新型平面式磁浮定位系統之設計、控制與實驗Design, Control, and Experiment of a Novel Planar Maglev Positioning System," Master Thesis, Institude of Electrical Engineering, National Taiwan University, R.O.C., 2003. Shin-Guang Huang ( 黃馨廣 ), "新型磁浮精密定位系統之設計、控制與實驗Design Control and Experiment of a Novel Precise Maglev Positioning System," Master Thesis, Institude of Electrical Engineering, National Taiwan University, R.O.C., 2002. Ming-Chiuan Shiu ( 許銘全 ), "新型平面式磁浮定位系統之設計與控制Design and Control of a Novel Planar Maglev Positioning System," Master Thesis, Institude of Electrical Engineering, National Taiwan University, R.O.C., 2001. Jim-Wei Wu ( 吳俊緯 ), "以利薩茹層疊式局部掃描實現高速大範圍之原子力顯微鏡 ," Ph. D. Dissertation, Department of Electrical Engineering, National Taiwan University, R.O.C., 2013. Shao-Kang Hung ( 洪紹剛 ), "新型原子力顯微鏡系統之設計與控制 ," Dissertation, Department of Electrical Engineering, National Taiwan University, R.O.C., 2007. Mei-Yung Chen ( 陳美勇 ), "磁浮精密定位系統之分析,模型推導與控制器設計 Analysis, Modeling and Controller Design of a High-Precision Magnetically Levitated Positioning System ," Ph.D. Dissertation, Department of Electrical Engineering, National Taiwan University, R.O.C., 2003.